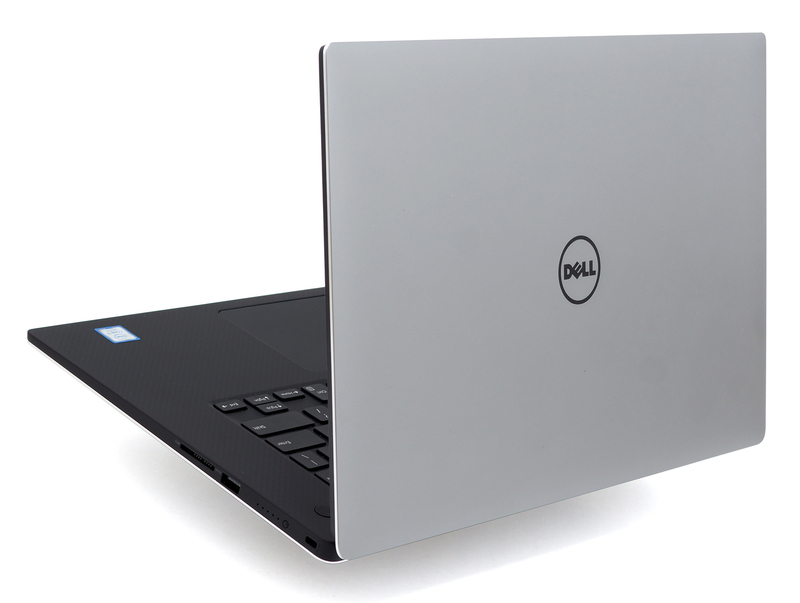 The XPS series from Dell have been praised for their extraordinary design, build quality paired with performance. This has been proven to be a successful approach to the premium business segment and looks like Dell wants to bring the same concept into its professional mobile workstations. With the Precision 5520 (and its predecessor, the 5510), it’s clear to see that the lineup is receiving the XPS treatment and that’s probably a good thing. Although the XPS 15 and the Precision 5520 look exactly the same, there are several key differences even in the design department. 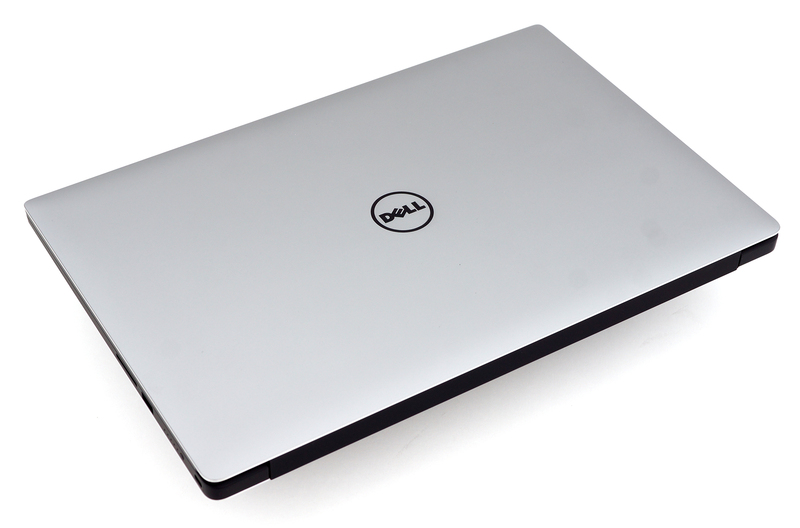 The XPS 15 remains as a slightly more portable option as the Precision 5520 sports a bit thicker chassis so a better cooling can be provided, especially since the laptop will have to handle long and heavy workloads. The second thing is obviously the hardware – the XPS family receives the mainstream Intel Core i7-7700HQ CPU and NVIDIA’s latest GeForce 1050 GPU, while the Precision 5520 takes care of the strictly business-oriented share of the market with Intel Core i7-7820HQ and the Quadro M1200 GPU with 4GB of dedicated GDDR5 memory. But if you want to go even further, Dell is offering the Intel Xeon E3-1505M v5 and v6 – their latest mobile processors for workstations. As far as screen options are concerned, the laptop can be configured with a standard Full HD IPS display and a 4K UHD one as well. We will focus on the (probably) the most sought after configuration with the Core i7-7820HQ, Quadro M1200 and the standard Full HD IPS panel. Even with this “mid-range” configuration, the price of the laptop is nearly €2 500 so is it worth your hard-earned money? We find out in the full review below. 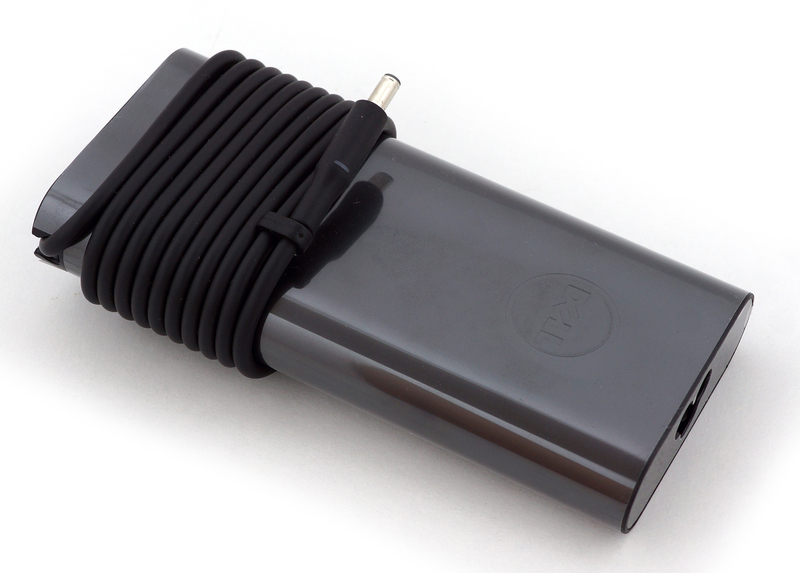 The laptop comes in a similar to the XPS 15 black “premium” box with the usual user manuals, AC adapter and power cord. 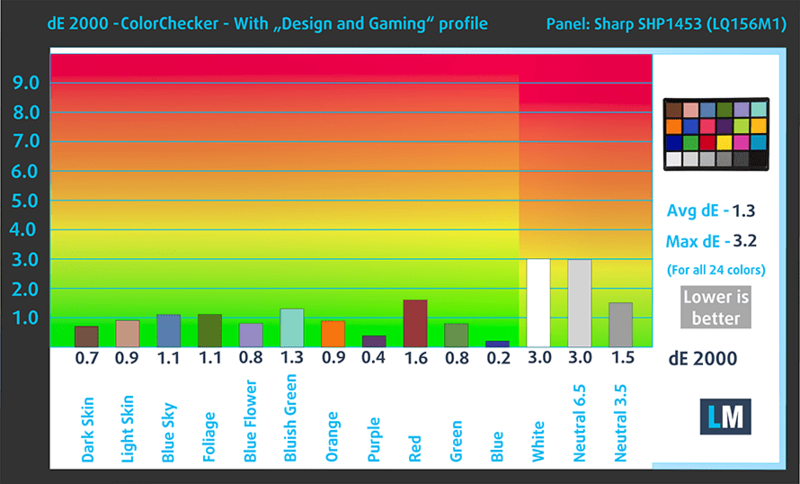 As we already said, there’s no major difference between the XPS 15 and the Precision 5520 when it comes to appearance. Both cases combine the anodized aluminum, soft-touch matte silicone finish for the interior and carbon fiber base, which threads can be easily seen. The lid consists of a thick anodized aluminum sheet with absolutely no flex and bending. We still complain, however, about the overly tightened hinge – both hands are always needed to open the notebook. But on the other hand, this assures stable working environment and no screen sway, especially when working on the touch-enabled version. Opening the screen reveals once more the extremely thin screen bezels that are the main contributing factor of the small chassis. 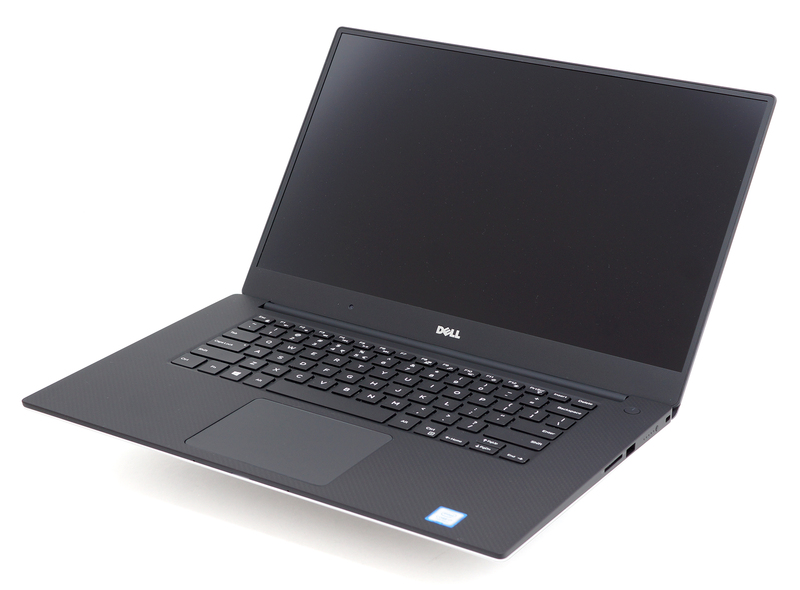 This has enabled Dell to incorporate a 15.6-inch screen inside a typical 14-inch body. The only real issue with this design is the awkward webcam placement. And as for the bottom of the chassis, it sports the same aluminum sheet with a big grill for cool air intake. The sides remain the same – soft-touch matte plastic with all connectors that you’d need – USB 3.0, HDMI, USB-C 3.1 with Thunderbolt 3 support and the 3.5 mm audio jack on the left and a single USB 3.0 port and an SD card reader on the right. The small button for indicating battery level is still here as well. And the only real change here is the overall thickness of the machine – while the XPS 15 goes from 11 mm up to 17 mm at its thickest point, the Precision 5520 measures at 21 mm – barely noticeable to be honest. Probably the most iconic part of the laptop is the interior – slightly transparent soft-touch matte finish on top of the carbon fiber composite. 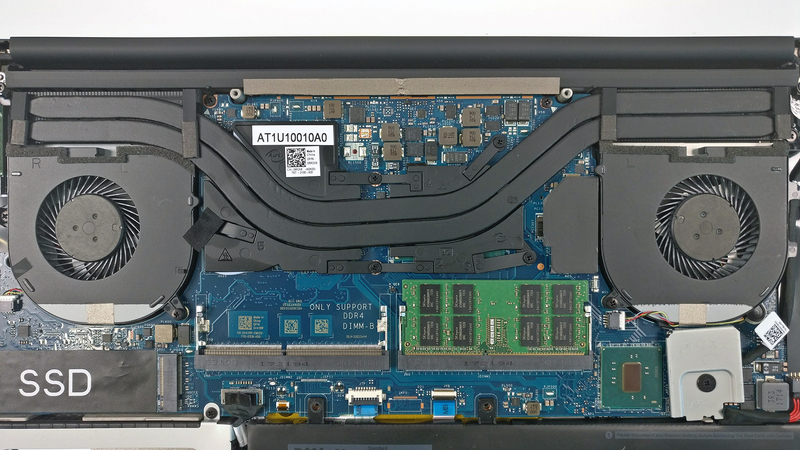 Not only does this choice of material give a distinct look of the laptop, it doesn’t add to much weight and doesn’t take away the sturdiness of the chassis. Our only complaint is that the surface is a huge fingerprint magnet so frequent cleaning is a must. 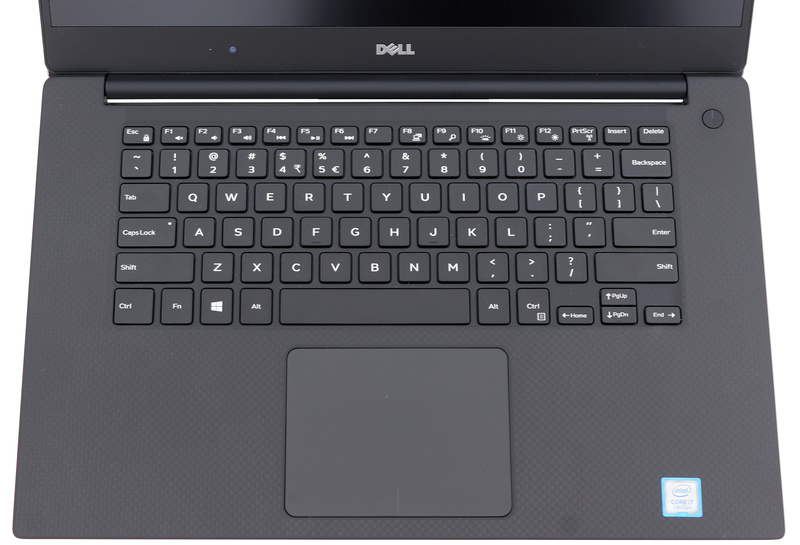 Fortunately, Dell hasn’t changed the input devices as well – excellent keyboard with a bit short (1.3 mm) travel but satisfying clicky tactile feedback paired with a big trackpad registering every gesture, swipe and click accurately. From a device that costs this much, we weren’t expecting anything less, to be honest. 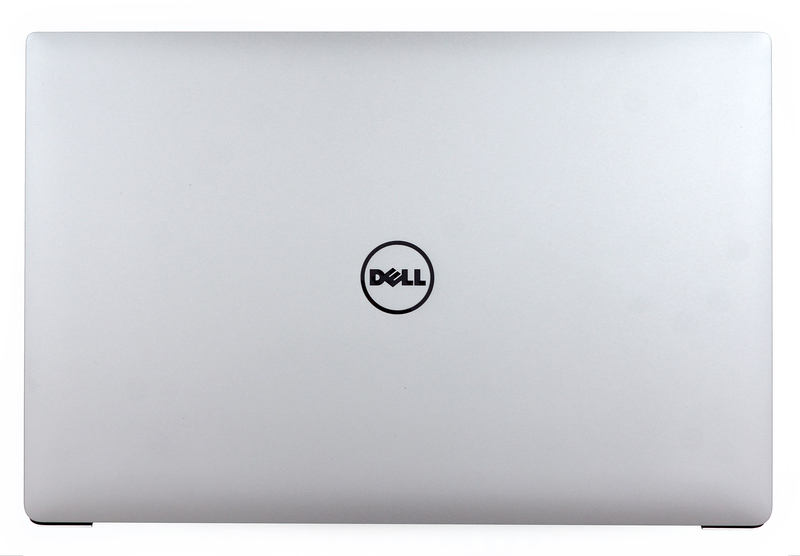 The device inherits the stunning simplistic looks of the XPS series as well as the impeccable build quality. The main key selling point of this powerful workstation is its portability. 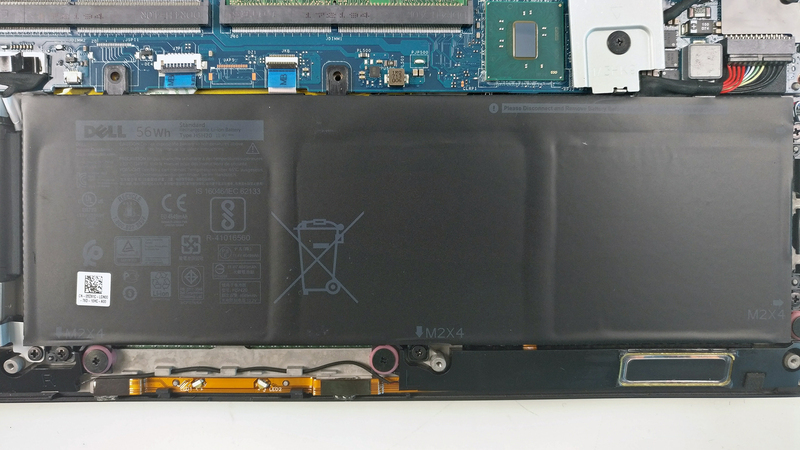 Just like the XPS 15, the Precision 5520 isn’t equipped with service lids and to access all of the internals, you’d need to remove the bottom plate, which is rather easy anyway. Just remove all the screws on the bottom including the one located under the metal lid in the middle. 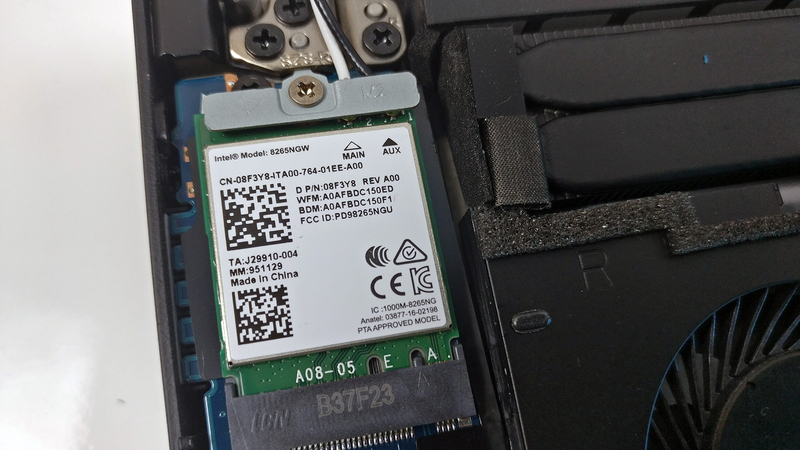 Similar to the XPS 15 configurations, the Precision 5520 comes with either big battery and just M.2 SSD slot or with 2.5-inch HDD/SSD bay, smaller battery and M.2 slot. 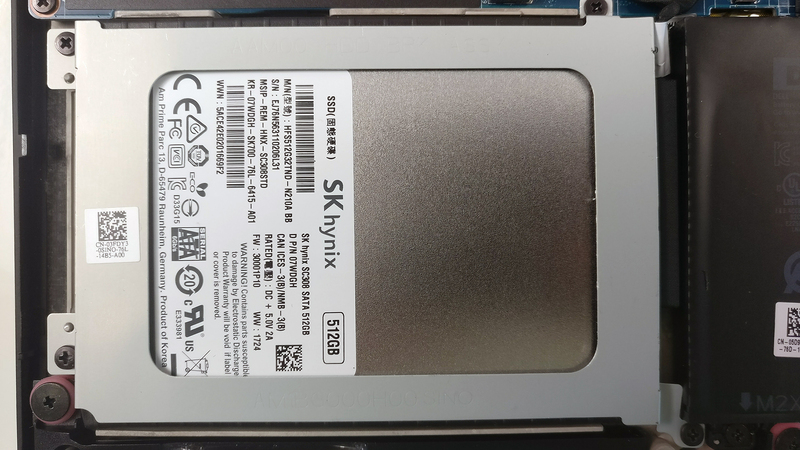 The unit we reviewed had the smaller 56Wh battery with the 2.5-inch slot being occupied by an SK Hynix SATA SSD with 512GB capacity. 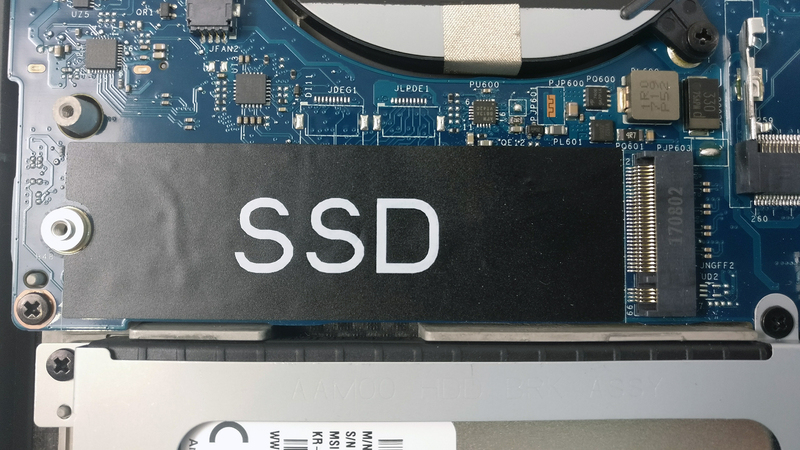 The M.2 PCIe NVMe SSD slot was available for upgrade. The motherboard comes with two available RAM slots each supporting up to 16GB of DDR4-2400 memory each. 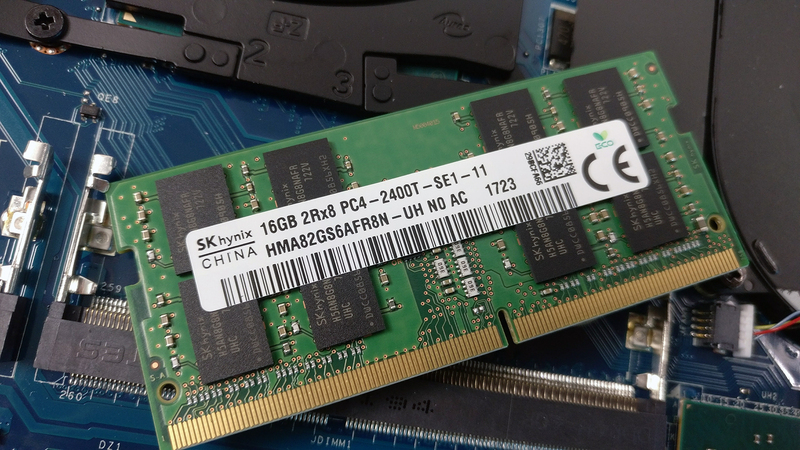 The unit we’ve reviewed came with a single SK Hynix 16GB DDR4-2400 chip. 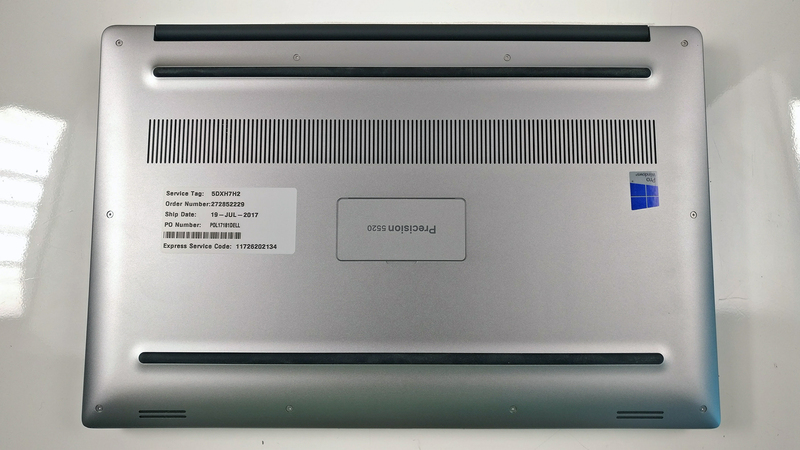 The Wi-Fi adapter is placed in the upper left corner (with the bottom of the machine facing upwards) and it’s Intel 8265NGW. 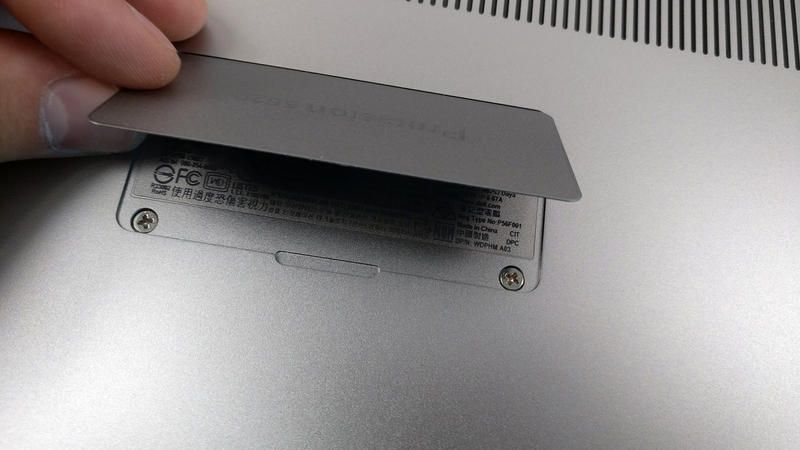 As we already said, the notebook comes with a 56Wh battery unit placed under the palm rest area. 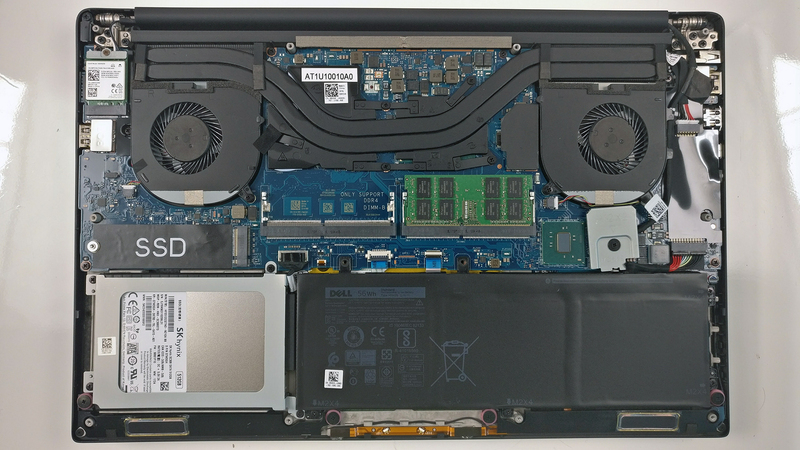 The cooling design isn’t much different from the XPS 15 – in fact, it’s absolutely identical – two heat pipes go across both heatsinks and connect the cooling fans placed on both sides. And despite the fact that the cooling system looks reliable, the thin chassis makes the cooling pretty hard due to the limited airflow. Our stress tests confirm that. The Full HD version of the machine comes with the same 1080p IPS panel from Sharp as the one we found in the XPS 15 (9560). However, there are some key differences in the unit we’ve tested. 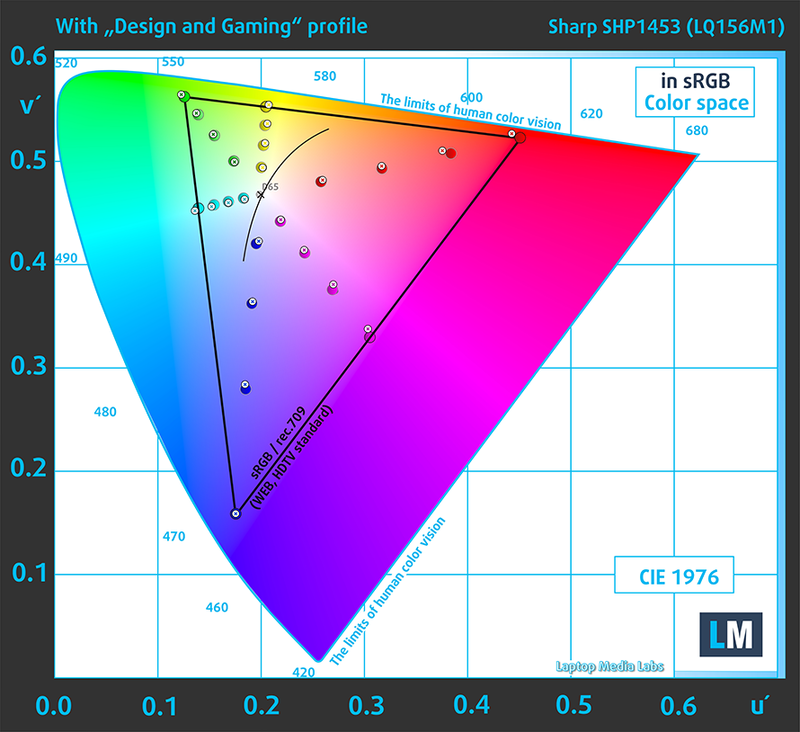 The panel’s model number is SHP1453 (LQ156MQ) and has 142 ppi and 0.18 x 0.18 mm pixel pitch. It can be considered as “Retina” when viewed from a distance equal or greater than 60 cm. We’ve measured a maximum brightness of 404 cd/m2 in the center of the panel and 393 cd/m2 as average across the surface with just 6% deviation. The color temperature is a little colder than it should be at maximum brightness – 7600K and it does become a tad colder as we go along the grayscale. You can see how values change at 34% brightness (140 cd/m2) in the image below. The maximum dE2000 color deviation at 34% brightness is 2.0 – a good result since values a above 4.0 are unwanted, especially when color-sensitive work is involved. The contrrast ratio is 1600:1 and comes down to 1300:1 after calibration. 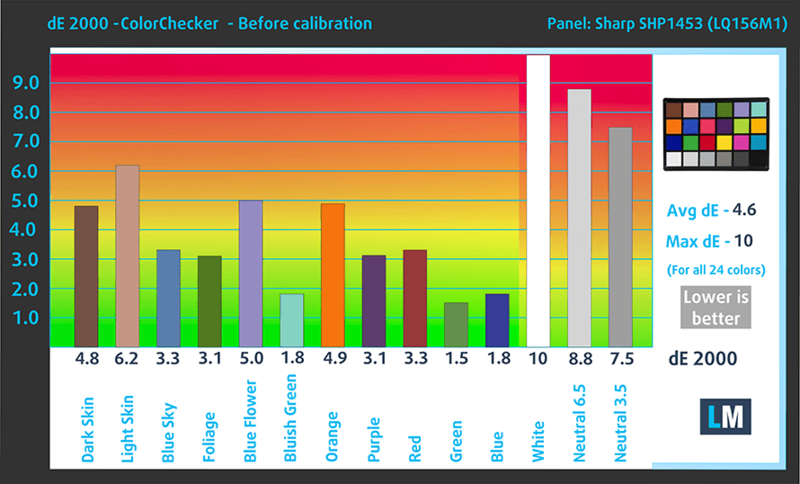 While the sRGB coverage of the XPS 15 was 95%, here our equipment measured 98%, which is pretty close to the sRGB/ITU-R BT.709 standard meaning it can achieve exceptionally low dE2000 after calibration. We didn’t detect PWM above 25% brightness (100 cd/m2) but even if you go under that, the frequency of the emitted light is too high to make any difference to the general users. Only those who have extra sensitive eyes may feel the negative impact. As always, we weren’t expecting anything less than stellar properties from the IPS panel on the Precision 5520. It clearly is designed for professionals who look for something reliable that can get the work done on the go. The display covers almost all of the sRGB color gamut, has really high contrast ratio, it’s exceptionally bright and doesn’t use PWM above 25% brightness making an excellent choice during long hours of work. And in some cases, with a little help from our “Design and Gaming” profile, the notebook can be used for color-sensitive work as well. The sound quality is pretty good – the highs, mids and lows are clear and crisp. The battery life on this power-sucking machine is just phenomenal but it really depends on the configuration you choose. If you choose to go with the extra storage, battery capacity will drop significantly to 56Wh, which usually comes with the Full HD panel whereas the 4K UHD variant is powered up by a 97Wh so things seem to be balanced out. In any case, we were pretty surprised by the outstanding web browsing runtimes even with the energy-sipping Core i7-7820HQ 45W TDP processor. All tests were performed using the same settings as always – Wi-Fi turned on, screen brightness set to 120 cd/m2 and Windows battery saving feature switched on. Excellent web browsing score – 800 minutes (13 hours and 20 minutes). Significantly lower video playback runtime but still pretty decent – 400 minutes (6 hours and 40 minute). Of course, the laptop isn’t made for gaming away from the power source but it’s good to know that it can handle heavy workload almost two hours – 117 minutes (1 hour and 57 minutes). The Core i7-7820HQ is a high-performance quad-core processor based on the 14nm Kaby Lake generation of processors from Intel sharing most of the features with the Core i7-7820HK while being more consumer-oriented since it lacks overclocking. In any case, it offers the much-needed Hyper-Threading technology, it has Intel’s HD Graphics 630 iGPU on board and supports dual-channel DDR4-2400/DDR3L-1600 memory but it’s clocked at a slightly higher frequency than the standard Core i7-7820HK – 2.9 – 3.9 GHz. However, for four active cores, the CPU’s frequency drops to 3.5 GHz and 3.7 GHz for two active cores. Just like all high-performance quad-core processors from Intel, the whole chip is rated at 45W including the Intel HD Graphics 630 iGPU and the memory controller. Here you can see an approximate comparison between the CPUs that can be found in the Dell Precision 15 5520 models on the market. 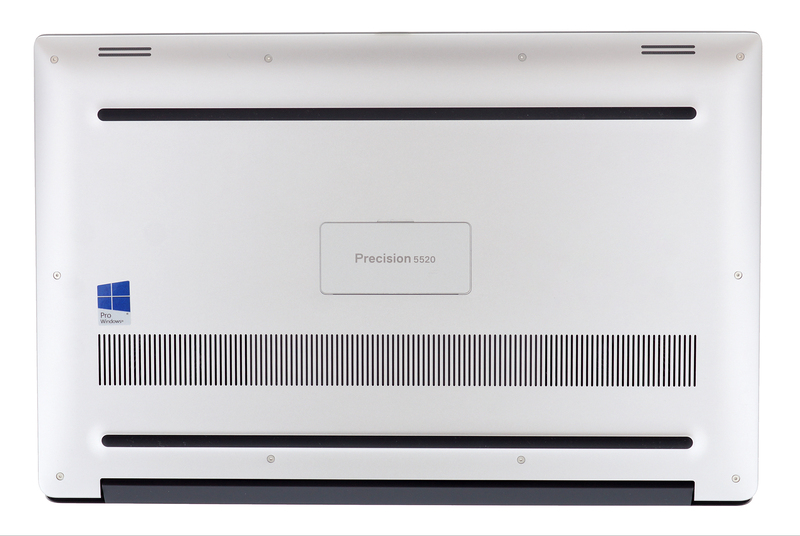 This way you can decide for yourself which Dell Precision 15 5520 model is the best bang for your buck. Fritz is a chess benchmark that tests the computing capabilities of the CPU with various chess moves. 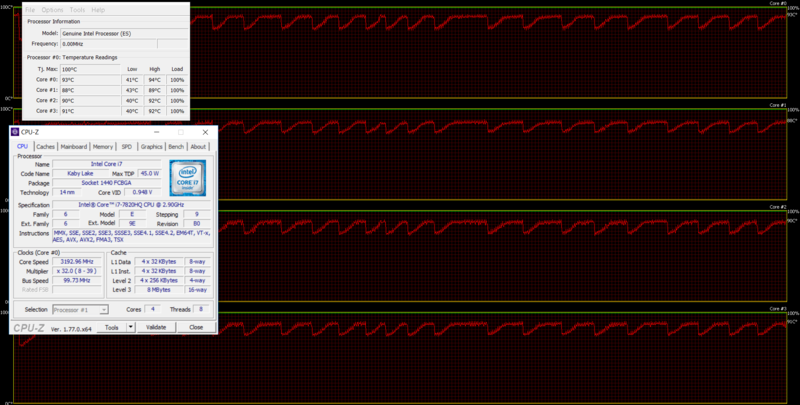 The Intel Core i7-7820HQ scored 13.986 million moves per second. In comparison, one of the most powerful chess computers, Deep(er) Blue, was able to squeeze out 200 million moves per second. In 1997 Deep(er) Blue even beat the famous Garry Kasparov with 3.5 to 2.5. Here you can see an approximate comparison between the GPUs that can be found in the Dell Precision 15 5520 models on the market. This way you can decide for yourself which Dell Precision 15 5520 model is the best bang for your buck. The stress tests that we perform can’t be taken as a representation of real-life use but they remain as the most reliable way to assess the overall performance and stability of the cooling system in the long run. As usual, we started off with 100% CPU load for an hour. At first, the processor was running at its maximum operating frequency for four active cores (3.5 GHz) but shortly after started to fluctuate between 3.1 – 3.5 GHz. Also, temperatures were a bit higher than we would like them to be but still, this can’t be considered as thermal throttling. 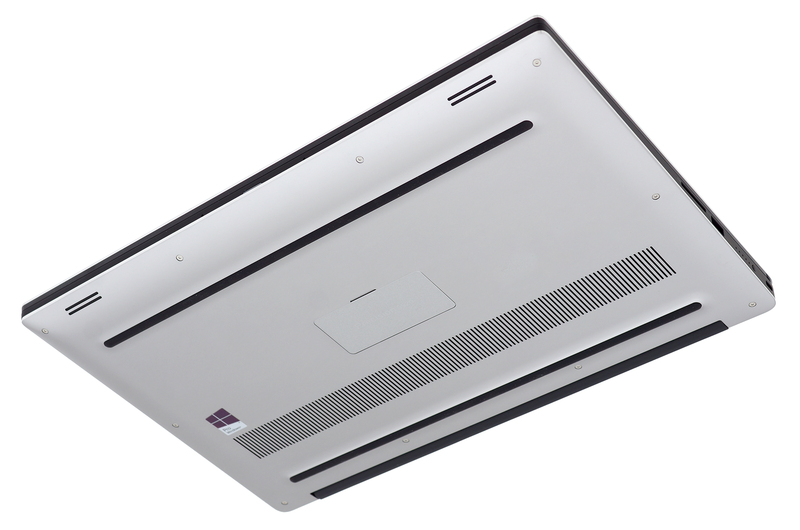 It does show, however, that the cooling solution isn’t able to keep up with the demanding hardware during heavy workloads. Switching on the GPU stress test after an hour resulted in CPU throttling at around 2.1 GHz (2.9 GHz is the base operating frequency) while the GPU didn’t even reach its base frequency. 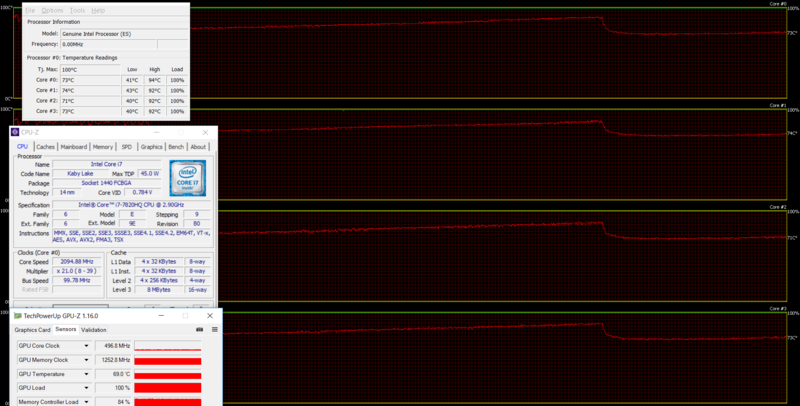 Running at just 69 °C, the Quadro M1200 was floating around 500 MHz most of the time. 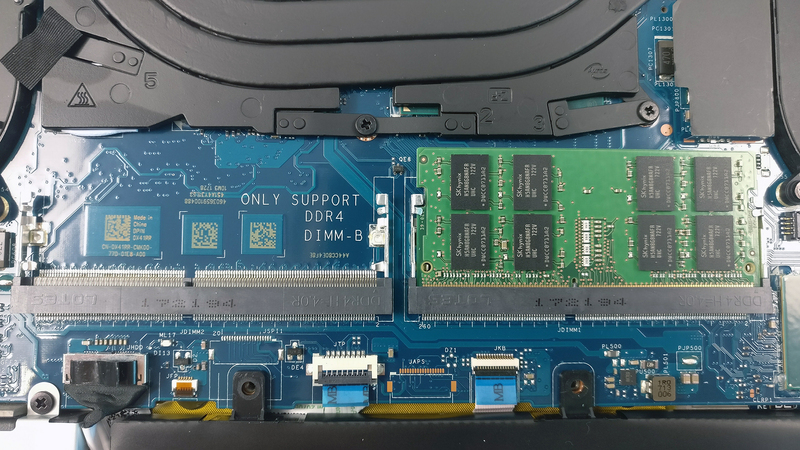 Although in other cases this shouldn’t be an absolute deal-breaker, in this situation where the Precision 5520 should be able to handle heavy workloads – due to the nature of the laptop – it should be taken into consideration for sure. Interestingly enough, temperatures on the surface didn’t go too far. The only warm spot is in the upper center of the keyboard near the screen hinge. 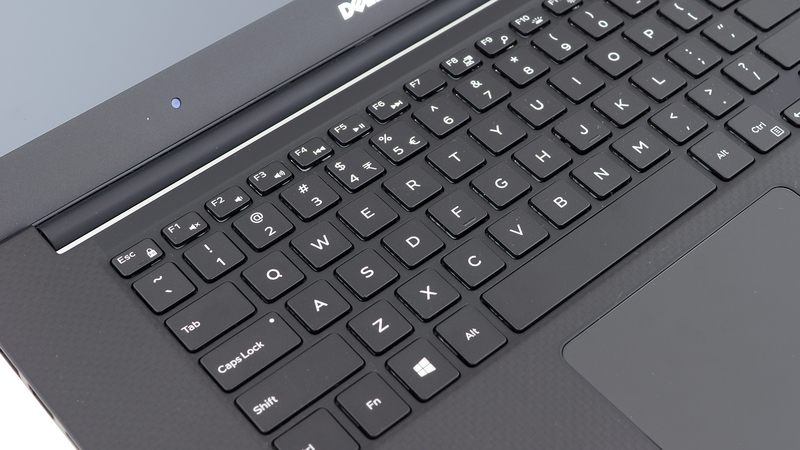 The Dell Precision 5520 checks almost all boxes for a professional 15-inch workstation. Using the base principles of the XPS lineup, the Precision 5520 is one of the most portable and well-designed workstations we’ve ever come across. With the use of high-quality premium materials, the laptop is not only super rigid but also thin and light. And thanks to the thin screen bezels, the machine fits into the 14-inch category with ease. The input devices are comfortable as well and we are not talking only about work on the go. We weren’t expecting anything less with this price tag, though. The notebook continues to impress with exceptional image quality thanks to the Sharp IPS panel and when paired with our custom profiles, the machine can be used for color-sensitive work as well. In addition, the absence of PWM above 100 cd/m2 makes it perfect for long working sessions. Speaking of which, you can also do that on battery since the Precision 5520 delivers outstanding web browsing runtimes for such powerful 15-inch device. Finally, we want to address the elephant in the room – how well does the cooling system handles the powerful hardware considering the thin and light design of the chassis. Unfortunately, not very well, at least according to our extreme stress tests. The CPU can’t sustain its maximum operating frequency for long periods of time (understand more than 10-15 minutes) and when the GPU is running at 100% alongside the CPU, it throttles massively. In most situations, this shouldn’t be an issue but when long hours of rendering or just other types of heavy workload is involved, the Precision 5520 just isn’t able to deliver. In any case, if you are not looking to substitute for your desktop workstation and the price isn’t a deciding factor, the Precision 5520 is one of the best high-end solutions out there offering exceptional user experience, feel and good short-term burst performance.